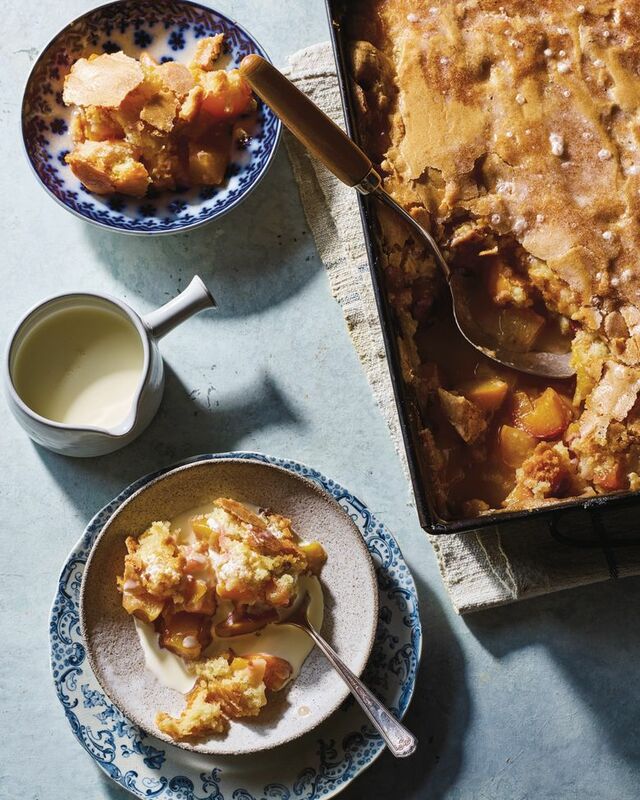 With hot water poured on top, Peach Cobbler with Hot Sugar Crust, from Renee Erickson and Susan Kaplan, is both brilliant and a little bizarre. THE FIRST TIME I tried the peach cobbler recipe, it sounded completely bizarre. I double-checked with the friend who sent it to me. The cobbler, from Seattle’s late Boat Street Cafe, went on to become our favorite family dessert, with a delectable top crust formed by drizzling hot water over sugar. My son even requests it instead of cake for his February birthday — good thing it also works with frozen fruit. It’s bizarre, yes, but also genius. That’s how the recipe made it into “Genius Desserts” by Kristen Miglore (Ten Speed Press, $35), an outgrowth from the “Genius Recipes” column that Miglore has written since 2011 for Food52.com. “It’s just so in your face, how different it is,” Miglore told me when we talked cobbler on her recent Seattle visit. She found that recipe, which chef Renee Erickson inherited from original Boat Street owner Susan Kaplan, in Erickson’s cookbook. How do you locate genius? 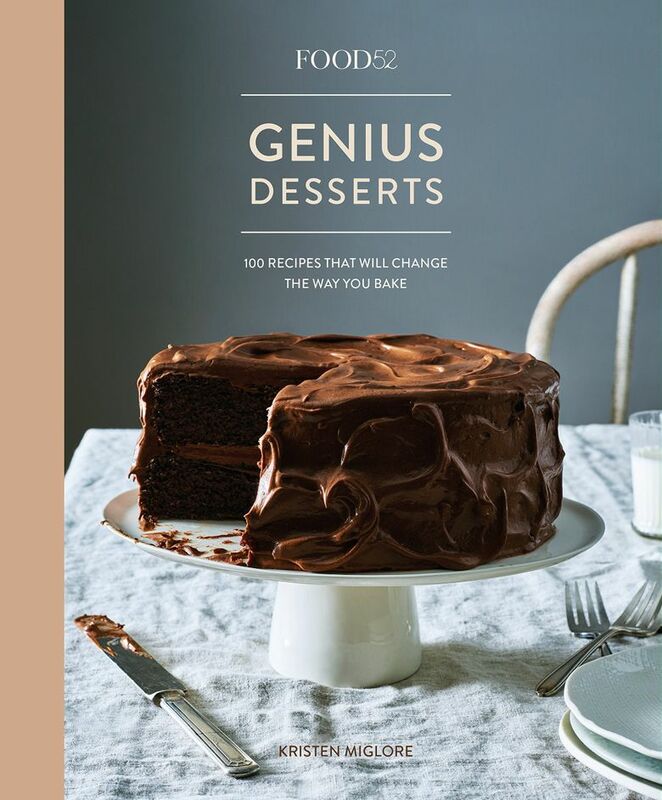 Miglore sent a call out “to as many people I could think of who would have strong opinions about desserts,” including professional chefs and home bakers and column readers. She paged through cookbook libraries and ordered a lot of out-of-print books. Then came tons of recipe-testing. Sounds fun, but that added up to months and months of Saturdays in Food52’s New York test kitchen, baking up to a dozen recipes a day with assistant Makinze Gore. Miglore got pretty tired of sugar by the end — except for chocolate queen Alice Medrich’s Nibby Buckwheat Butter Cookies with cacao nibs and buckwheat flour, an intriguing and not-too-sweet shortbread. Some icons appear in the final book, including World Peace Cookies from Dorie Greenspan and Pierre Herme, and Claudia Fleming’s Guinness Stout Ginger Cake. Popularity wasn’t a requirement, though. Plenty of new and lesser-known treats also made the “genius” cut. Great flavor was the obvious prerequisite, but genius desserts also had to innovate, to problem-solve, to surprise. For Fleming’s ginger cake, for instance, Miglore wasn’t sure at first why it was so renowned. Research led her to two theories: One is the combination of molasses and oil that lets the cake stay moist for days, allowing spice flavors to develop. Another is that ginger cake recipes rarely called for stout before Fleming’s adaptation took hold. As dessert fans already know, the Northwest has plenty of genius. With Erickson alone, I’d find it dreamy but difficult to choose between the cobbler and her meringues, bread pudding and brownies. Another local represented in the book is author-restaurateur Molly Wizenberg, with Cinnamon Toast Cookies and Vanilla Bean Rice Pudding. Maybe there’s room for a sequel? 1. Heat the oven to 350 degrees, with a rack in the center. Line a large rimmed baking sheet with aluminum foil. 2. Arrange the peaches in a 9-by-13-inch or similar-size baking pan or gratin dish. Using a zester or microplane, zest about 2 teaspoons of lemon zest evenly over the fruit. Cut the lemon in half, and squeeze about ¼ cup of lemon juice over the top. 3. In a stand mixer fitted with the paddle attachment, cream the butter and 1½ cups of the sugar on medium speed until creamy but sandy, about 1 minute. Add the flour, baking powder and salt, and beat on medium speed until all the flour is incorporated and the mixture is evenly crumbly, about 30 seconds more. Scrape down the sides of the bowl. With the mixer on low speed, slowly pour in the milk. Increase the speed to medium, and beat until the batter is light and fluffy, about 2 minutes. 4. Scoop the batter in about 6 large blobs over the peaches. With an offset spatula or the back of a big spoon, carefully spread the batter evenly over the fruit so it’s no more than about ½-inch thick in any one place. 5. Sprinkle the remaining ½ cup sugar over the batter. Drizzle the hot water evenly over the sugar, using it to melt the sugar topping. 6. Set the pan on the foil-lined baking sheet, and bake the cobbler until the top is golden brown and cracked, 70 to 80 minutes. A toothpick stuck in the topping should come out clean or with just crumbs clinging — be sure to check in a few places. 7. Let the cobbler cool for about 30 minutes to firm up. Serve warm, scooping it into big bowls and pouring a little heavy cream over the top. Refrigerate any leftovers airtight.